While citing the RC174 as proof of time travel is patently absurd, the notion is not quite as outlandishly bizarre as it may first appear. 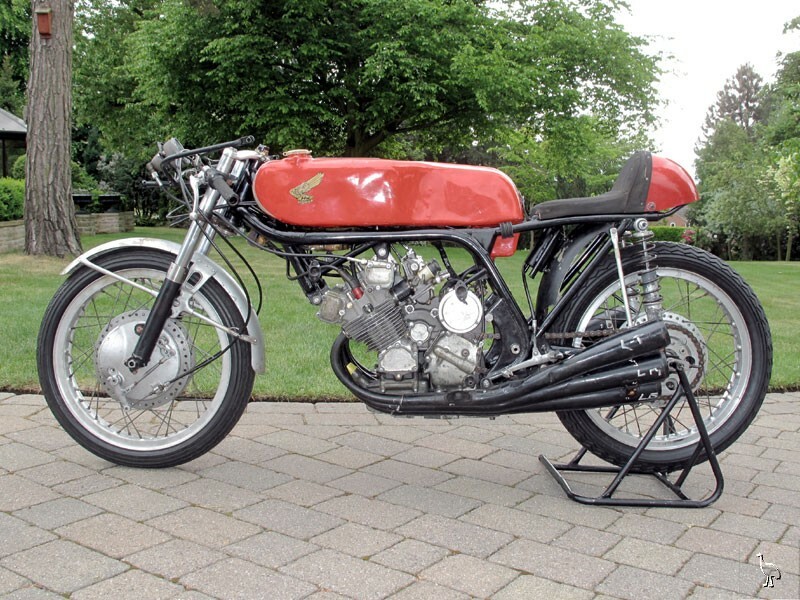 For Honda's ultimate six-cylinder racing motorcycle - like many of mankind's greatest creations - was both rooted-in, and yet divorced from, its era. A handsome but predominantly conventional design, what made the RC174 so special was its engine. Some four decades after the multiple grand prix runner had retired from frontline competition, Honda sanctioned a tiny series of replicas. Tasked with reverse engineering the legendary bike's 297cc powerplant, analysts at the French firm JPX (a subsidiary of Mecachrome) were stunned to discover that it contained a number of unfamiliar but highly sophisticated alloys and treatment processes. A gifted metallurgist, Sochiro Honda was renowned for pushing his employees hard but also for listening to their ideas. The company's research and development department was thus a hotbed of innovation. Arguably, among the (automotive) world's most exquisite expressions of form following function, the RC174's engine was just as much a work of art as Patek Philippe's Supercomplication or one of Faberge's Imperial Eggs. Each individual component was constructed according to its intended performance capabilities with little or no margin for error. Supple enough in one plane to be deformed by hand but sufficiently strong in another to spin to 17,000rpm, the thirteen-piece crankshaft ran in seven bearings (24mm in the centre tapering out to 14mm at the ends) and played host to three different types of con-rod. There are only two RC174 motorcycles in existence and the other one is owned by Honda. Rarer and more exotic than such four-wheeled motorsport titans as the Mercedes-Benz W154 or Auto-Union D-type, the RC174 was no less crushingly effective. A milestone year for those interested in 'blue chip' machinery, be it on two wheels or four, 2010 saw a Jaguar D-type reportedly change hands for $10 million and the ex-Dr Peter Williamson Bugatti Type 57SC reputedly command $35 million. Few would argue that in terms of iconic motorcycles, the Honda RC174 is as good as it gets. And for those unmoved by its scarcity, competition pedigree or technological brilliance, there is always the exhaust note. Like Enzo Ferrari, Sochiro Honda felt that the engine was the heart and soul of a machine and nothing but nothing sounds like the big Honda 'Six'.